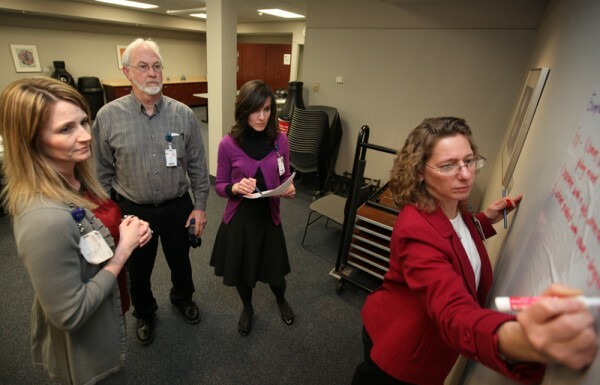 Blue Belt candidates Sarrah Scarmack, pharmacy manager; George Mackall, engineering and facility repair manager; Annie Sofran, senior PR specialist; and Mary Sebest, operations manager, report the results of their error-proofing walk in the Pharmacy. Before the big game, football players huddle in the locker room with their coaches, devising plays on a large board in an effort to win the game. But huddling is no longer exclusively for sports. 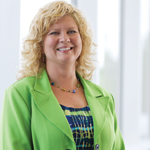 It’s just one of the new strategies being applied at Akron Children’s Hospital to ensure its staff functions as a winning team. Huddling is part of Blue Belt training, which was designed to improve team communications, eliminate waste, reduce errors, provide more consistent processes, and improve patient care. 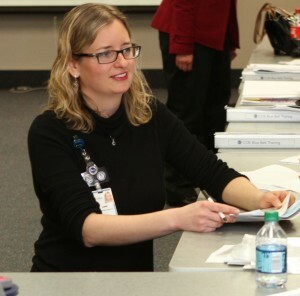 Anne Musitano, PharmD, MBOE, administrative director of Akron Children’s Mark A. Watson Center for Operations Excellence, is a Blue Belt instructor who began coaching leaders in Mahoning Valley last December. “Through Blue Belt, we can show people how to improve their area and make it easier to function,” Musitano said. The program comprises 6, 4-hour sessions. Usually the Blue Belt training is given to leaders in one department at a time, but the Mahoning Valley is an exception. Because of the campus’ smaller size, Musitano is training leaders in a variety of departments. Lisa Taafe, MSN, RN, CNP, clinical administrative director for the Mahoning Valley, said that has been an advantage. The first session focused on the characteristics of leaders and how to effectively eliminate waste and increase value. In the second session, the group learned process mapping, where leaders identify steps in a process and potential improvements. At the third session, they learned how their departments could huddle for about 5 minutes every day. They have huddle boards, where they can track a metric of their choice. Department managers then huddle with directors, and the directors huddle with vice presidents. The goal is to streamline the flow of information. The last three sessions focus on standard of work instructions, error proofing and communication. Before the participants receive Blue Belt certification, Musitano attends one of their huddles to ensure they’re actively applying these methods. Taafe said she hopes the new strategies lead to long-term improvements.